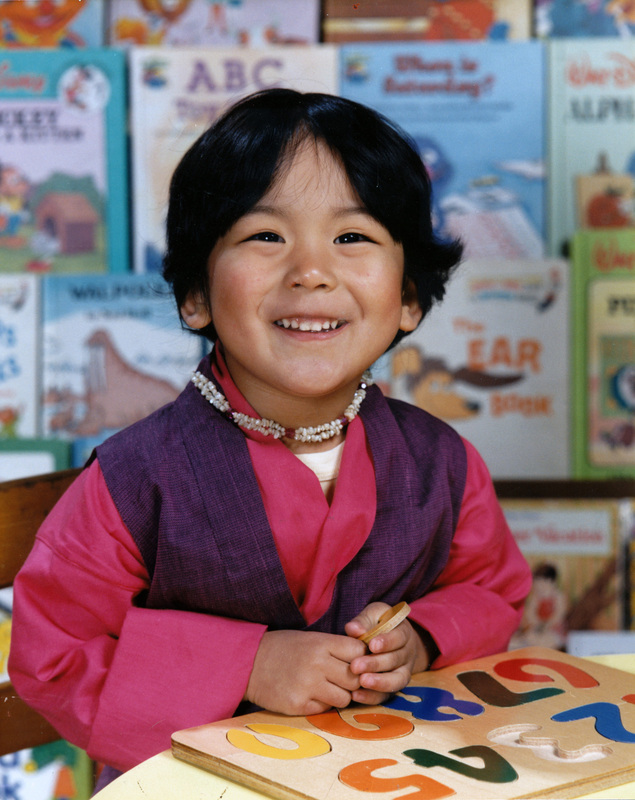 Hi, my name is Kunsang and I’m a Tibetan Buddhist,” was how I once introduced myself when I was little. A few weeks ago during Lhakar I was visiting my family’s home in New Jersey and came across this old photo from preschool. In it I’m wearing a chuba (traditional Tibetan dress) that my father’s family had sent over from India along with a necklace my grandmother had made. Looking at the photo, I realized it was probably the first and last time I ever wore a chuba at school until my college graduation. Then it made me think about what it might have been like the first time I wore my chuba to school, and how I had begun to develop ideas about my own identity. So for my first post I thought I would talk about the start of forming one’s identity because it’s something close to my heart, being a T+ (Tibetan plus More!) I also wanted to acknowledge Lhakar by telling a story that celebrates my first idea of Tibetan self. My father escaped Tibet in 1959 when he was nine years old. He lived in Nepal and India before coming to New York in 1979. My mother was born in the States, and her mother in Sofia, Bulgaria. My parents met in the early 80s just as the Tibet scene in New York City was getting started. At that time there were only a couple hundred Tibetans living in the area so my idea of Tibet was pretty limited. I never learned Tibetan. I didn’t have any Tibetan friends. When I was growing up my family was really involved in the Tibet scene as my dad was a former Nechung monk who had started a foundation for his monastery and then opened a Tibetan shop, Do Kham, which became a hub of fashion, Tibet news and Buddhism. So perhaps in observing my father during those early years talking to so many people about Tibet, I wanted to emulate his charm. But then I think to myself…Why? Why would a child ever say something like that?! How does a child decide to identify themselves? Most would say it depends on their environment. My parents are both Tibetan and Kalmyk and I grew up catching the odds and ends of two distinct diasporic communities. My aunt used to tease me that when I was little my family would take turns asking me if was Tibetan or Mongolian, and I would always say I was whichever side of the family I was with at the time. Pretty clever eh? Other than learning how to play the game at an early age, I think that it left me with a pretty confused sense of nationality and nation-hood. I thought about how kids begin to form ideas of themselves in any big or small way, and how the most minute detail of things like a piece of your mother’s jewelry or noticing your father’s hands could make a kid question where they came from, sometimes in the most specific, or the most abstract forms. Recently I visited my Momo-la (grandmother) in the hospital. She had suddenly become very ill so most of my father’s family had flocked to her side. I was hesitant at first but I knew it was important to see her so my mother and I prepared ourselves for what we thought might be our last goodbye. My Momo-la and I have never shared a common language. I’ve never really known what to say when I see her, or how to ask her all the questions I would have wanted about her life, but all I could ever manage to do was offer my hands and hug her tiny body. Seeing her from the foot of the bed she was so small, wearing a hospital gown like any other patient. Yet, she still had her hair braided around her head like any other Tibetan grandmother, still wearing her traditional jewelry, wrapped in cashmere and wool blankets on top of her hospital linens. At one point I was sitting directly across from her at the edge of the bed and without lifting my head up I could only see the green and blue blankets that led up to her chest. I saw her hands resting together with her gold ring laid with Tibetan turquoise and I thought this amongst all things, is how I would know who she is. This is how she is still able without words, unlike me as a child, to embody the essence of herself, even at the end of her life. I used my big voice in my small body to declare who I was and my statement reflected my parents’ histories. So as I looked around the room and saw her children, grandchildren and great grandchildren at her side, I realized that this room reflected everything about her. They were all extensions of herself that told so much about her life and who we are. Of late, I have been hearing the term T+ which I feel is a very nice touch considering Tibetan community-in-exile is moderately xenophobic. Either ways, personally I think ethnicity (even as a diaspora) is but the backdrop of our identity. But to what degree do we embrace it and to what end? In the end, perhaps, only our actions will tell (obvious or subtle). But, “Hi, my name is Kunsang and I’m a Tibetan Buddhist,” Nicely done! Agree with all the comments above. Lovely story-telling! Loving the positive spin on “T+”.. and the idea that it is OK to be Tibetan and something else (often we are encouraged to be Tibetan but hide the other side of us, as was the case with me). But more so, you’ve given me the idea to take my daughter to her nursery in a tibetan chupa… tho che nang! Thank you. You reminded me how beautiful Family is.